MORE ARTISTS AND THEIR WORK STILL TO BE LISTED. 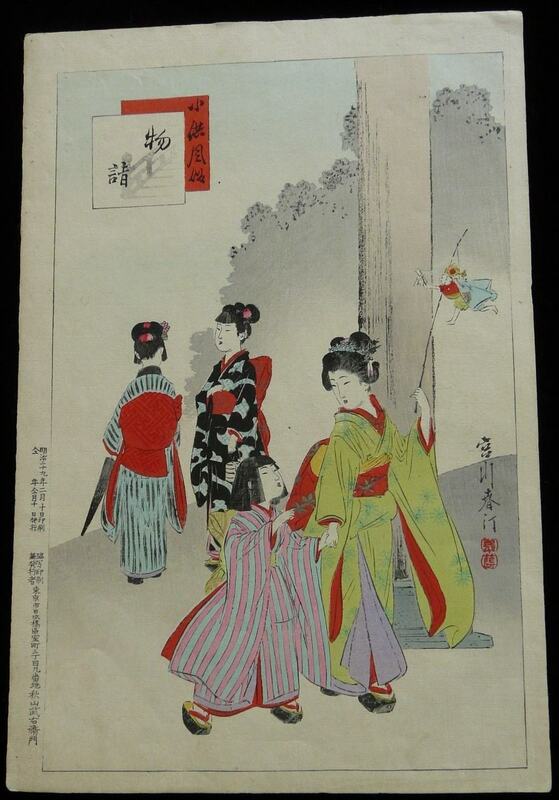 HASHIMOTO CHIKANOBU lived from 1838 until 1912. 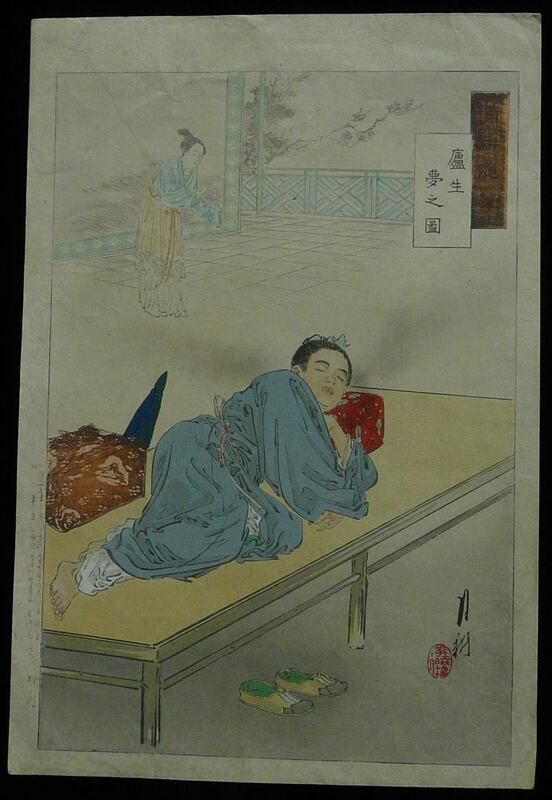 He was a student of both Utagawa Kuniyoshi and Utagawa Kunisada then later Toyohara Kunichika. His signatures included a number of “Go” names including Ikkakusai and Yoshu and he created a number of different series in a wide variety of genres. 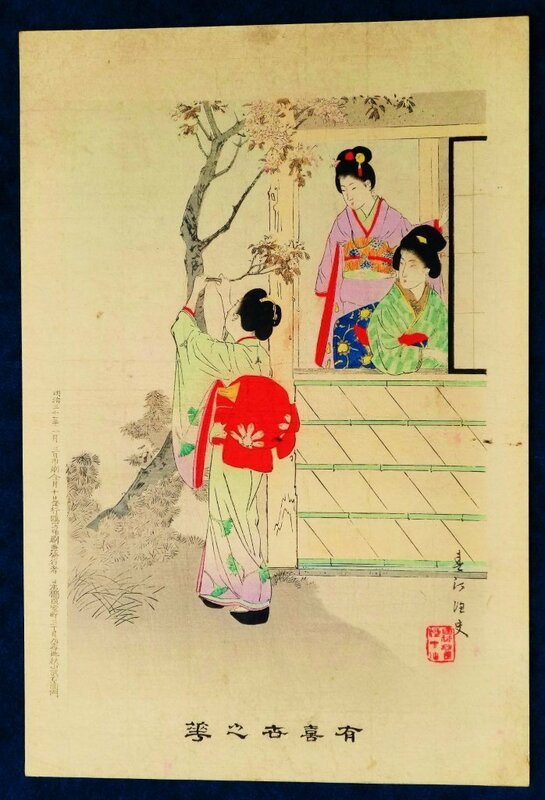 His most famous are those of beautiful women and Meiji Era traditions while among the rarest are his works of Kabuki scenes inspired by his master Kunichika in the first years of their liaison. FIRST EDITION – VERY RARE. FROM THE SERIES AZUMA NISHIKI CHUYA KURABE – EASTERN BROCADES, DAY AND NIGHT COMPARED. 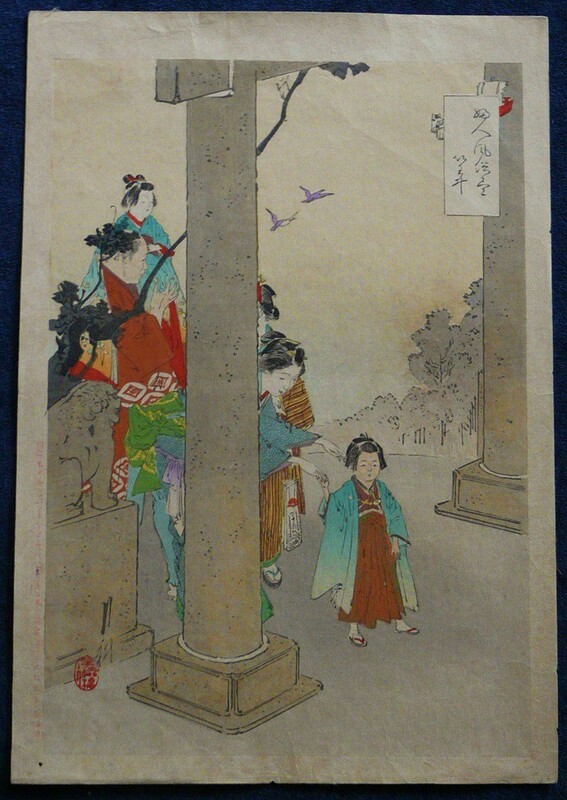 SIGNATURE: Yoshu Chikanobu Hitsu in Lower Left of Scene. DATE: Meiji 19 = 1886 with Full Authentication of Date and Yokoyaru Ryohachi Publisher’s Seal in left margin and Series Title in top right corner. CONDITION: Very good for Age – see photo. 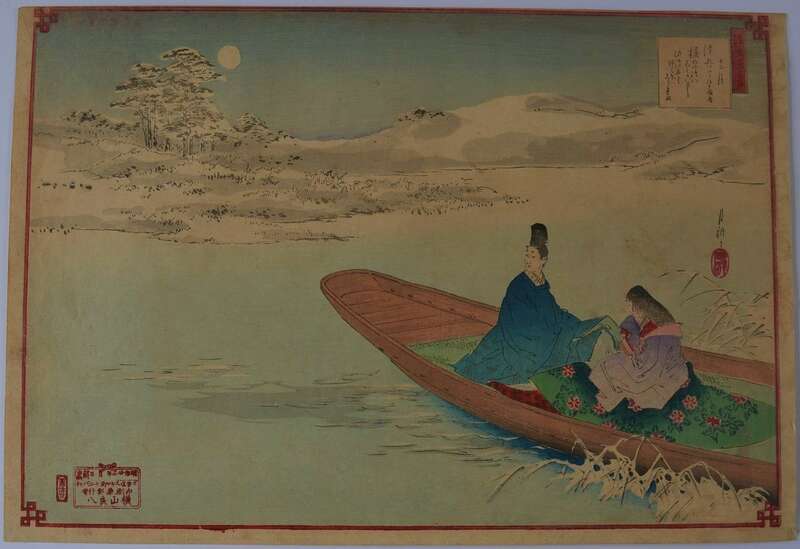 SIGNATURE: Yoshu Chikanobu Hitsu in Right of Scene. DATE: Meiji 19 = 1886 with Full Authentication of Date and Yokoyaru Ryohachi Publisher’s Seal and Series Title in the top panels. 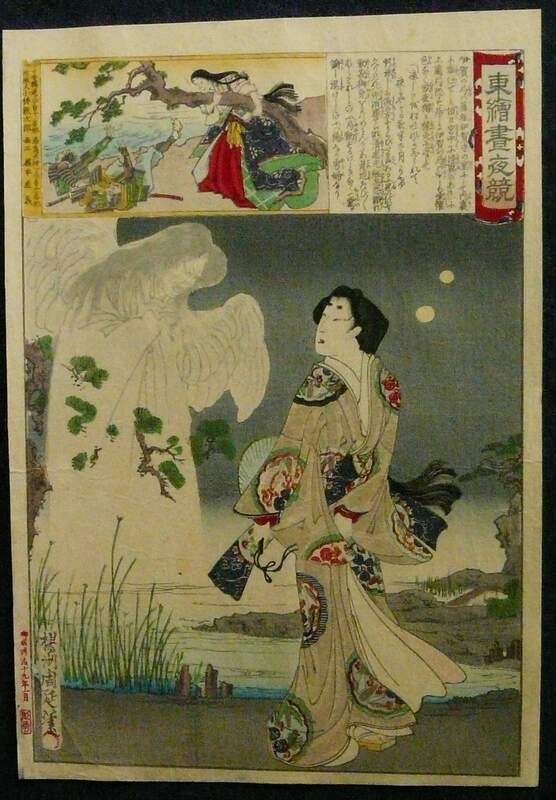 NOTES: The scene shows Rako seeing a vision of the Goddess. FROM THE SERIES EASTERN BROCADES DAY AND NIGHT COMPARED. 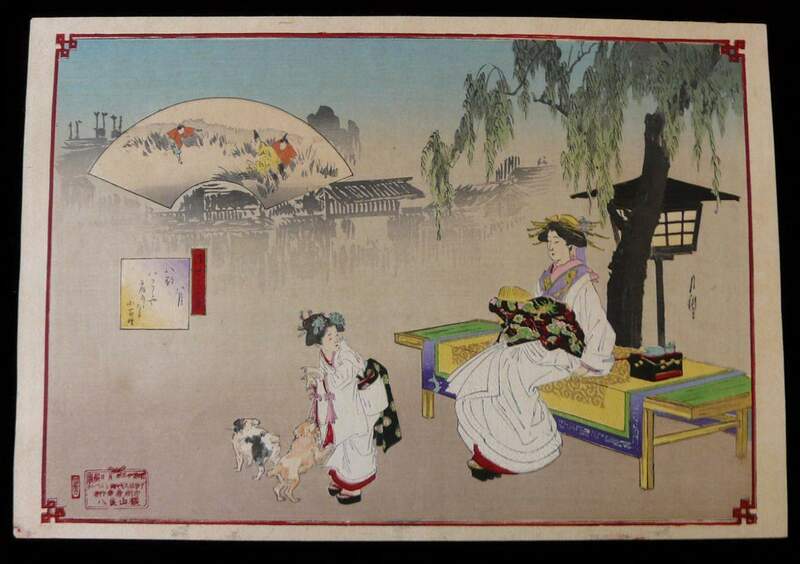 SIGNATURE: Yoshu Chikanobu Hitsu in Lower Right of Scene. DATE: Meiji 17 to 19 = 1884 to 1886 with Full Authentication of Date and Kobayashi Tetsujiro Publisher’s Seal in the left margin and Series Title in the top panels. 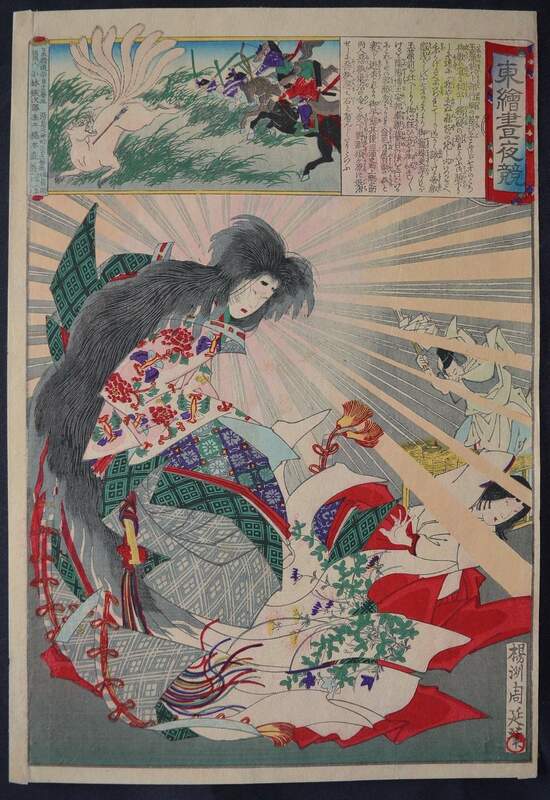 NOTES: The scene shows Tamano-no-mae the famous courtesan of Emporer Konde in her incarnation as the beautiful and learned courtesan and as the mythical nine tailed fox in the upper left panel.Rako seeing a vision of the Goddess. DATE: Meiji 19 = 1886 with Full Authentication of Date, Publisher’s Seal in the and Series Title in the top panels. 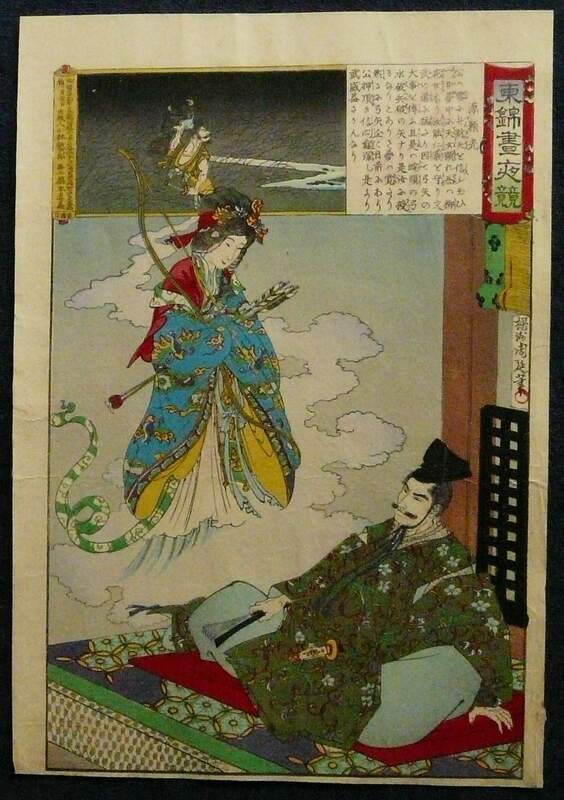 NOTES: The scene shows the nobleman Minamoto no Mitsunaka dreaming of the daughter of the dragon king who appears before him in his house. In the inset at the top of the scene Mitsunaka can be seen looking at a talisman of himself which he had created to protect himself. CONDITION: Very Good for Age – see photo. 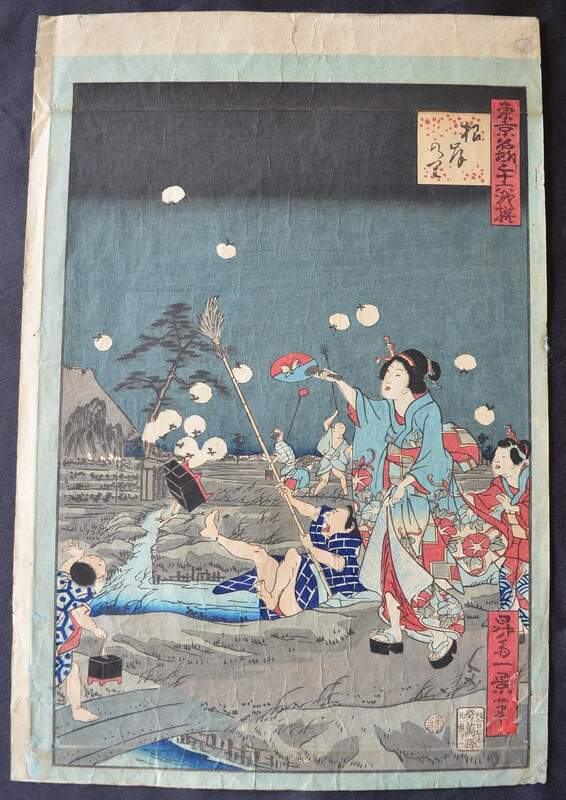 Old washi backing has helped to preserve this 130 year old woodblock print. DATE: Meiji 17 to 19 = 1884 to 1886 with Full Authentication of Date and Yokoyaru Ryohachi Publisher’s Seal and Series Title in the top panels. 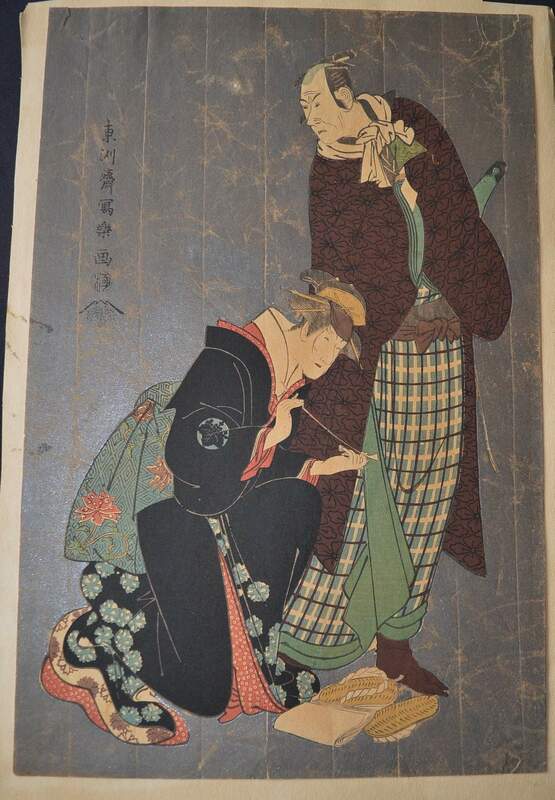 CONDITION: Very good for Age – Thin old washi backing has helped to preserve this print. See photo. 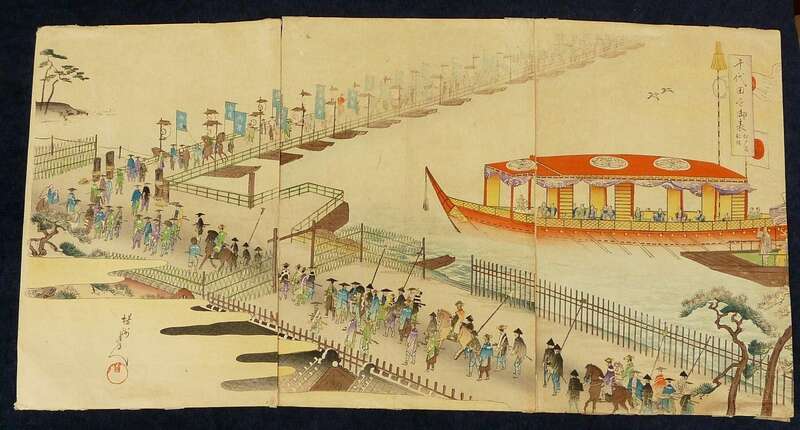 Shows A pleasure boat by the pier at to Tokugawa procession. THREE UNATTACHED OBAN SIZE WOODBLOCK PRINTS. 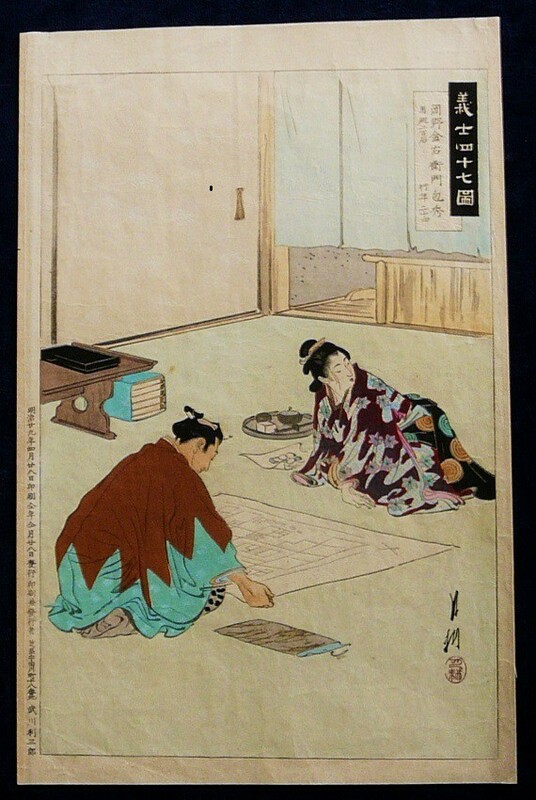 SIGNATURE: Yoshu Chikanobu Hitsu with red Yoshu seal below in Left Hand Panel. CONDITION: Average for Age – see photo. SIGNATURE: Chikanobu Hitsu with red Toshidama seal below in Left Hand Panel. DATE: Meiji 17 to 19 = 1884 to 1886 with Full Authentication of Date and Kobayashi Tetsujiro Publisher’s Seal in the left margin and Series Title in the left side of the central panel. 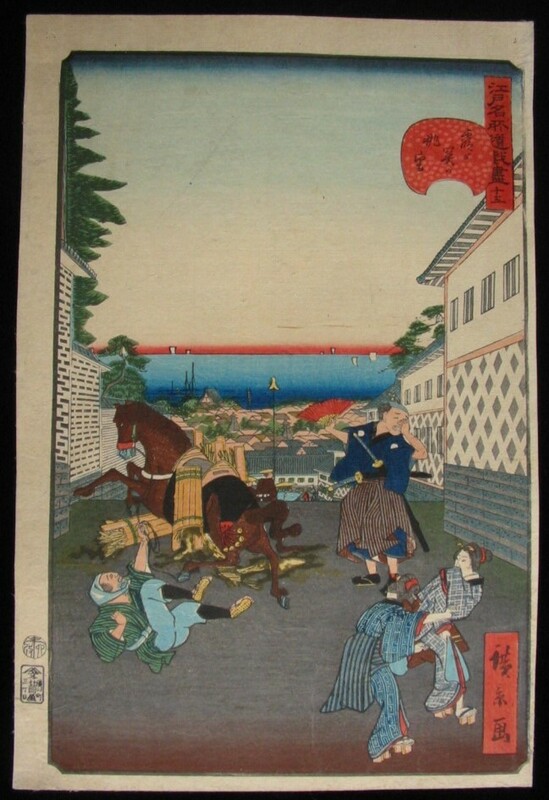 UTAGAWA HIROKAGE was a pupil of Ando Hiroshige and was only active as a Woodblock Print Artist from 1855 to 1865. 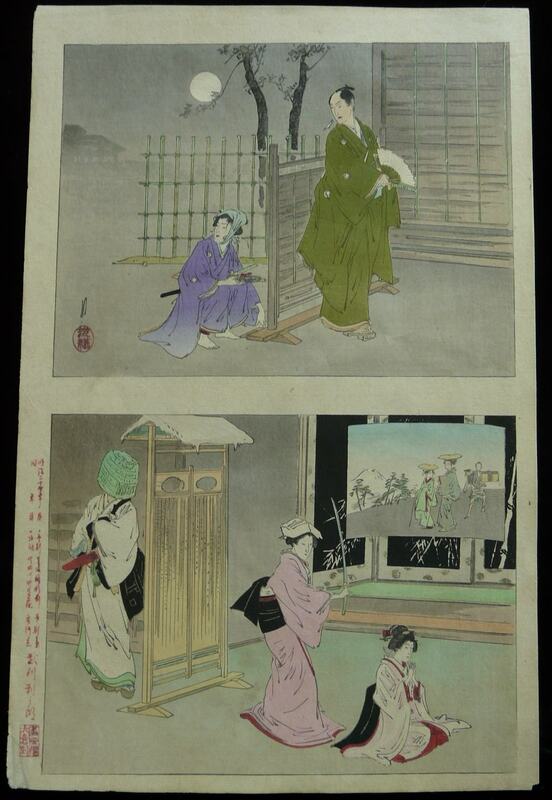 Among his minimal output was a popular series of known as the Comic Views of Edo. SIGNATURE: Hirokage Ga in the Red Panel in Lower Right of Scene. DATE: Dated 1859 by the Round Aratame Censor Seal in the Left Margin and Authenticated by the Publisher”s Seal Below this seal. 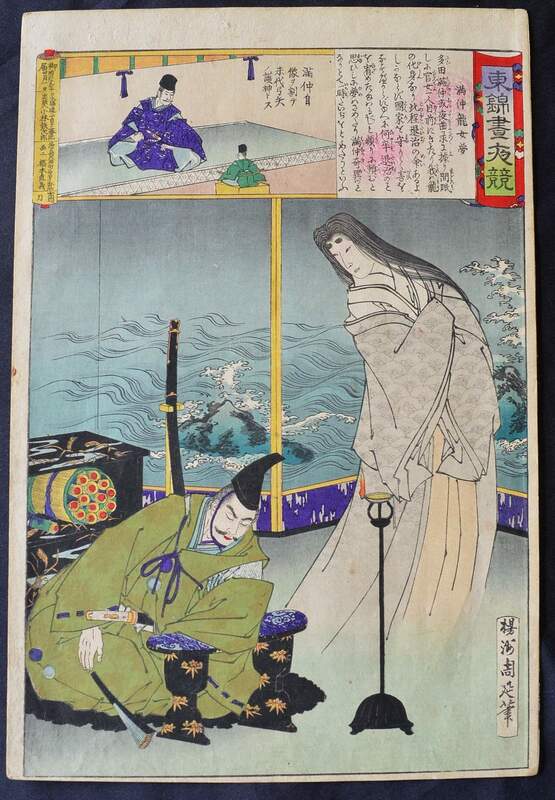 TOSHUSAI SHARAKU is one of the most obscure woodblock artists one could find. He was active for only ten months between 1794 and 1795 and he created mostly portraits of Kabuki Actors and Sumo Wrestlers. He produced over 120 prints over this short period of time but had few sales so stopped working as an artist. 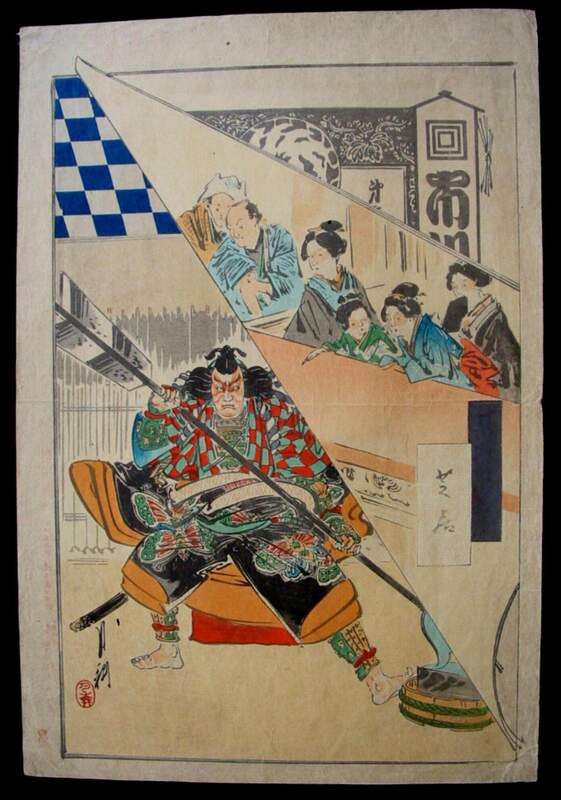 All the scenes he created were signed Sharaku although no-one knows his real name or dates of birth and death. Since his death many scholars have recognised him as one of the geniuses of the period. 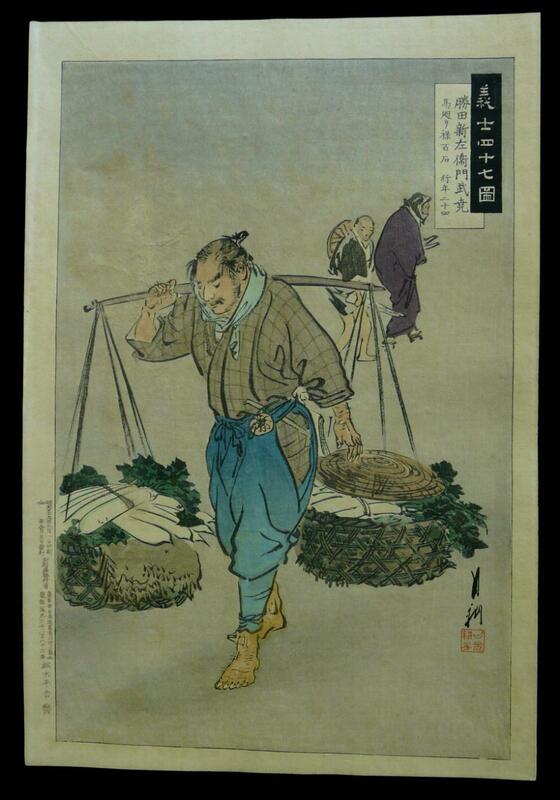 Publisher’s Seal: Hayashi Tadashi or Tsuta-Ya Jusaburo we think but are still researching this print. It present, as we have never found a similar example of this scene with the silver mica layered like this we so far can not identify its exact age or date but believe it to be between 1800 the 1870 at the latest. We will up date the details as we continue our research. GEKKO OGATA lived from 1859 to 1920. He was born an orphan and gained his name Gekko, which means moonlight, when adopted by the highly esteemed artist family of Ogata. He was a self taught woodblock print artist and created a truly individual style in his images. He is one of the most highly collectable Meiji era Artists. SIGNATURE: Gekko in right of scene. 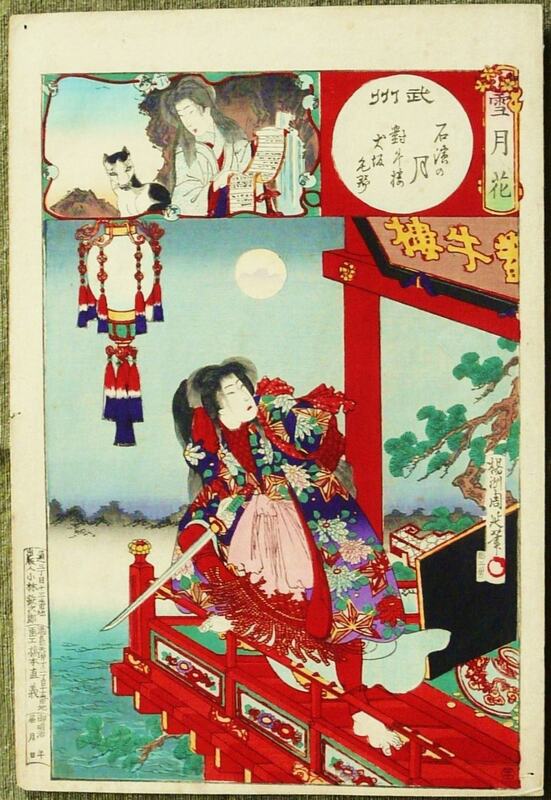 DATE: Meiji 23 = 1890 with Full Authentication Documentation in red panel in lower left of scene and the Iba-ya Sensaburo publisher’s seal on the left of this panel. SIGNATURE: Gekko in left of scene. DATE: Meiji 23 = 1890 with Full Authentication Documentation in red panel in lower right of scene and the Iba-ya Sensaburo publisher’s seal on the left of this panel. DATE: Circa 1880 with Artist’s signature and red seal in the bottom left of scene. DATE: 1898 with Full Authentication Documentation in left panel, now a little faded. DATE: Circa 1890 with Full Authentication Documentation in left margin, artist’s signature and red seal in lower right of scene. Published by Iatsuki Heikiche between 1895 and 1903. DATE: Circa 1890 with Publisher’s details, Date and Full Authentication Documentation in left margin. DATE: Circa 1890 from the Series Gekko’s Essay with Full Authentication Documentation in left margin, now a little faded. 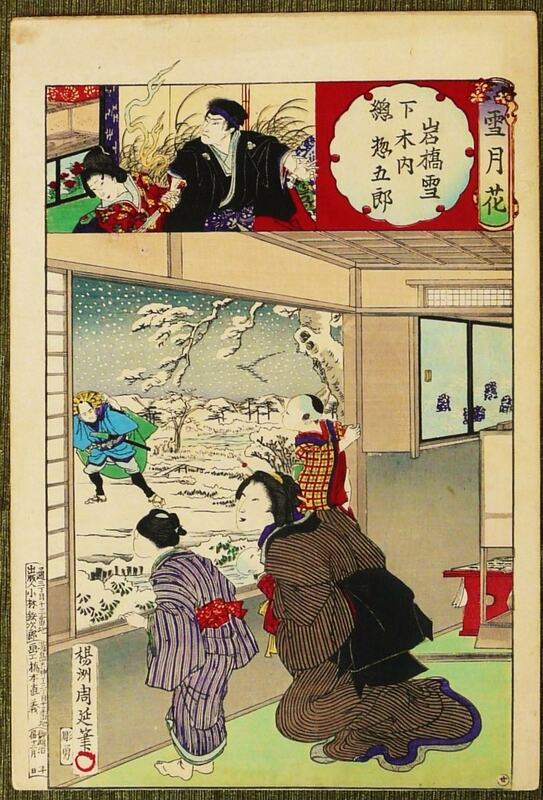 DATE: Meiji 22 = Circa 1880 with Full Authentication Documentation in red panel in lower right of scene and the Iba-ya Sensaburo publisher’s seal on the left of this panel. IKKEI SHOSAI Is one of the most obscure woodblock print artists from the Ukiyo-e period and his work is very RARE. 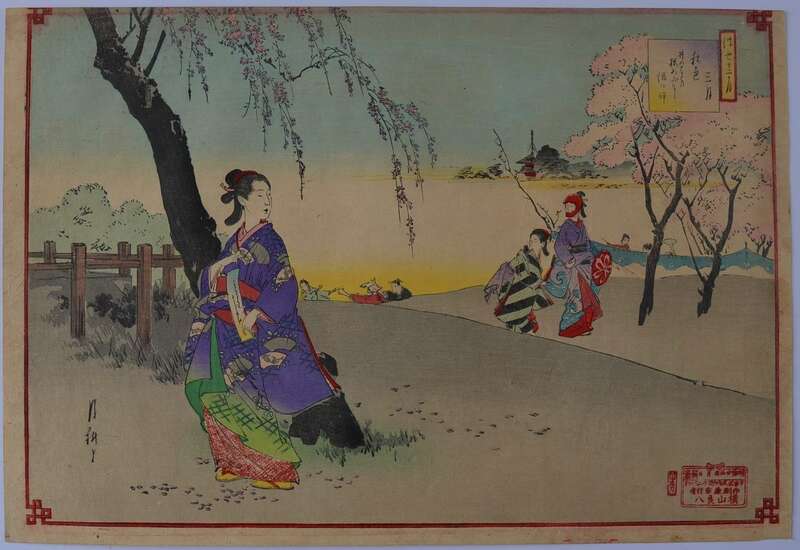 His woodblock prints were all created in the very early 1870s. We only have one Example from this series at present and I search for more of them every time I am in Japan. DATE: Round Aratame Censor Seal alongside the Artist’s Signature and Publisher’s Seal Accurately Dates the Scene to Between 1972 and 1975 as this is the only time this seal was used. 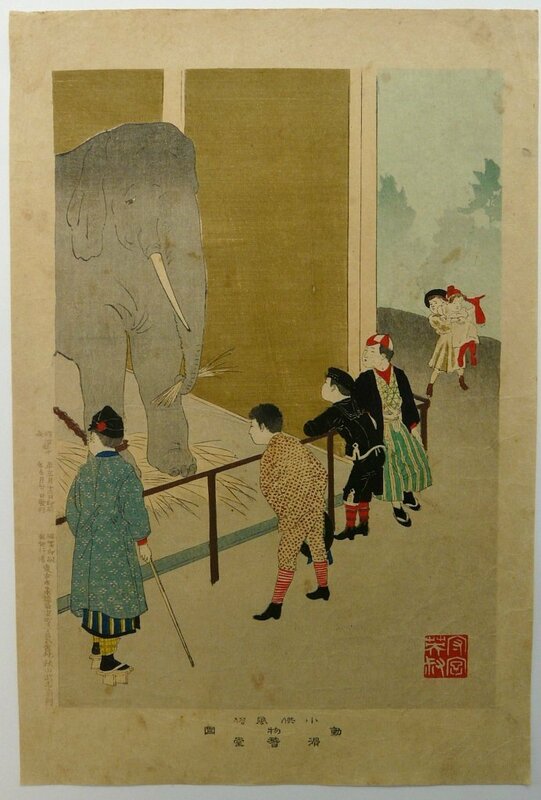 MIYAGAWA SHUNTEI lived from 1873 to 1914 and produced his finest work at the end of the 19th Century. 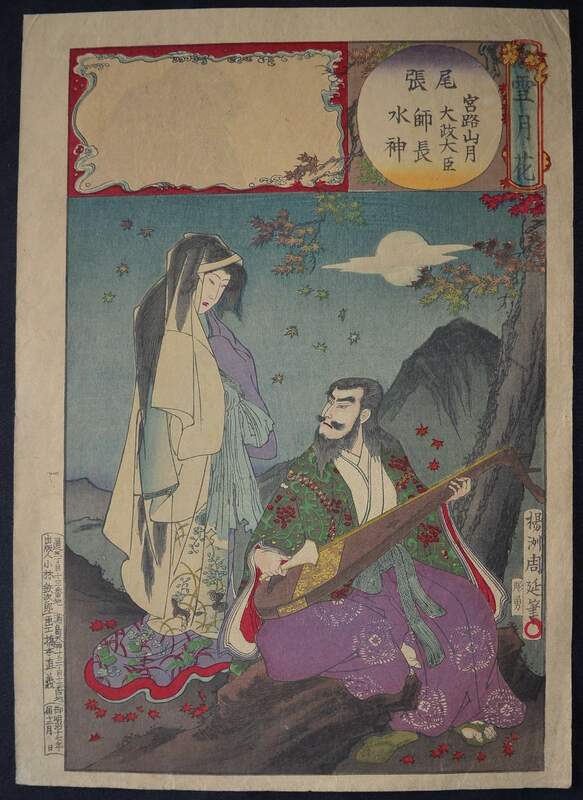 He is one of the more obscure Ukiyo-e artists who worked in the Meiji Period. He studied under Watanabe Shoka and Tomioka Eisen and in his short life created some very fine scenes which are now very rare and difficult to find. SIGNATURE: Shuntei with Red Seal below in the lower right of scene. 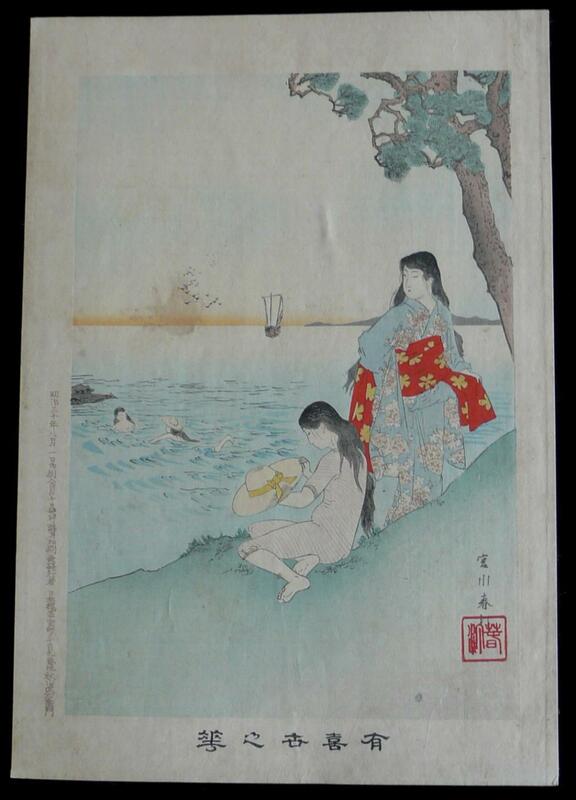 We also stock Japanese woodblock prints by the following Ukiyo-e artists. Just click on the name to go direct to their individual page.